Calculating Growth, Doubling Times, and etc. Obama's America-What if the Russians Had Invaded? I’m a bit of a partisan in this Baker City recall campaign, as anyone who reads the papers or goes to Council meetings knows, and some of you may be on the other side, but I felt it would be good to transmit some more information about the situation, even though many of you have no doubt already voted. What follows is a much-expanded version of the letter I sent in (350 words is always a tough assignment, at least for me). There have been many falsehoods and massive distortions, a veritable torrent of trash lately, emanating from the supporters of the recall, as well as from Steve Brocato and his former cronies. The spurious, last minute, tabloid style (think National Enquirer) attacks by Milo Pope and the recall committee show their desperation to convince people of the righteousness of their position, and to once again, turn the truth on it’s head. Here are a few responses to what the recall proponents have said and additional information to support what supporters of Mayor Dorrah and Councilor Calder have written. The recall committee wrote that “Many believe State Ethics Law has been violated. The evidence is overwhelming.” They go so far as to say that the Councilors who fired the City Manager were “placing themselves above the law” even though the City Charter says the City Manager “may be removed at the pleasure of a majority of the council.” Milo Pope had threatened to “sue you all” [the 4 councilors who fired Steve Brocato] at the June 9 Council meeting, but he didn’t sue because he knew his claims couldn’t be substantiated. His complaint to the Ethics Commission was returned with the words “the complaint is insufficient for the Commission to take action at this time.” As of last Friday, he did not respond with additional information, because, in my opinion, he didn’t have any. He’s had about three months to provide additional information, but apparently, he realizes that he can’t produce adequate evidence to show that any illegal meeting took place or that any legal actual conflict of interest existed. He and the recall committee have persisted in their claims of unethical behavior and illegal activities, but he and the recall committee have failed to sue or gain the support of the State Ethics Commission. 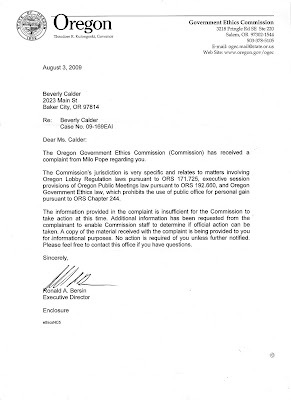 Here are two images of the response from the Oregon Government Ethic Commission letter that was sent to Councilor Calder, dated August 3, 2009. In his recent paid ads in the local papers, Mr. Pope has said that the actions to fire the City Manager are "dishonorable, thoughtless and harmful" but he says that "I regret having made that threat." Now we now why. Perhaps it was Mr. Pope who was being, and has been since his election to the Council, "dishonorable, thoughtless and harmful" by making charges that can't stand up and that encouraged Mr. Brocato's patrons to pursue this incredibly divisive and damaging recall. As I wrote in a previous letter to the editor "You may remember that when the last City Manager was summarily asked to leave, (Gordon Zimmerman, current City Administrator of the City of Oakridge), he graciously said "When the council says it's time to go, it's time to go. . . . . " There comes a time when the council wants to choose their own man." Of the first 629 petition signatures submitted, I estimated that over 44% of the petition circulators who gathered those signatures were, or were closely related to, police/dispatch personnel and realtors, far, far in excess of their percentage of our population. Sunfire Real Estate, Greg Sackos, and the Petry’s have been heavily involved in this recall effort, either through donations or the work of themselves, and one or more Intermountain Real Estate agents. Several police employees actually circulated petitions and over 50% of the force supported the recall in some way or another. Milo Pope, in his ad, says that “The Chief correctly declined [to eject the boisterous members of the audience, mostly city employees and relations so as to restore order], and stated that he worked for the city manager.” If that statement is true, and that is what I think I observed, then the Chief may not really understand that he works for all the citizens of Baker City, not just the City Manager (can you imagine the consequences???). Does it also explain why the police department engaged in a campaign to harass Beverly Calder in recent years as well? Many City administrators signed the petitions and pushed the recall. The unprofessional support, by many city administrative staff, of the City Manager during the June 9th Council meeting also seemed to indicate that they too felt they worked for Mr. Brocato, and not the Citizens of Baker City. Why would the Police Department and City Hall employees show such strong support for the recall? Well, really, who could blame them. The city administrators and police department know which side their bread is buttered on. At least one, if not two, employees mentioned the ease of the last contract negotiations as reasons to retain the City Manager. Brocato granted a new over-priced police building, exorbitant raises, bonuses, promotions, and generous COLAs over a 5 year contract period, as we entered the worst recessionary downturn in decades. [CORRECTION (9/14/09): I wrote in my blog and in an LTE: "A sergeant’s salary with 5 years goes from $51, 876/yr to $61, 224/yr plus benefits under the Brocato negotiated contract" I should have said "A sergeant’s salary with 5 years goes from $50, 784/yr to $61, 224/yr plus benefits under the Brocato negotiated contract"
I believe he was warned, and certainly should have realized, that the bubble was about to burst, and the taxpayers are paying for his generosity, ultimately approved by the Council, despite their own declining circumstances in this predictable recession. I believe realtors favored Brocato’s push to gentrify the neighborhoods so as to increase property values and their own commissions, and have other reasons as well. He and the City have been very accommodating of their input (but maybe not yours) during the recent codification process. The rest of the circulators were the three disgruntled Councilors with an apparent grudge against Beverly Calder, a Councilor who lost in the last election (Terry Schumacher), his daughter and son-in-law at the Sycamore Tree establishment, other assorted relatives of the recall proponents and supporters, and Brocato loyalists. Dennis Tietz “was elected Chief Executive Officer of the Company on December 11, 1998, and Chairman of the Board of Directors on March 30, 1999.” Mr. Tietz had been cleaning house after the securities fraud scandal. Mr. Brocato “resigned” on the day that Mr. Tietz became Chairman of the Board. (See: SEC report http://google.brand.edgar-online.com/EFX_dll/EDGARpro.dll?FetchFilingHTML1?ID=4650&SessionID=bwD6WC9Jmy7f4w7 ) Only then did the company turn around. Why did the Council Fire the City Manager? The recall committee claims that the Councilors acted above the law, but what about the recall committee? I filed a complaint with the Elections Division of the Secretary of State’s office on August 13, 2009, asking them to look into the reasons why the recall committee had not filed any financial statements with their office, as required by law, even though they had been spending money on the recall since around the third week of June. I, Beverly Calder, am writing to register a formal complaint against Chief Petitioner Jamey Hardy, Treasurer Kathye Corn and John Heriza for the false and misleading statements made in their Petition to Recall Beverly Calder, member of the City Council or Baker City, Oregon. I have recorded each of the accusations from the petition in bold italic followed by my refutation statement. Additionally, I have listed comments received about questionable handling of the petitions themselves. Unfortunately, in a small community such as Baker City most citizens are afraid to register a complaint. This has been compounded by the fact that the city police department has been so actively involved in this dispute. I have attached a couple of letters illustrating some of the contentiousness existing with two of the city councilors. I can provide specific dates, minutes of meetings or any further information as needed. • Beverly Calder continues to demonstrate her inability to work effectively with other council members. I admit it is difficult to productively deal with a councilor who accuses me of practicing Wicca and having a diagnosable mental illness in e-mails shared among councilors, city staff and members of the public. However, my only response to disrespectful remarks and comments made by two (of seven) councilors in public session illustrate this kind of character assassination is to calmly invoke Resolution 3407 outlining guidelines for council behavior, specifically regarding how we speak to one another. I seek to be as inclusive as possible on all issues coming before council. I am clearly on the majority side of substantive public issues and I seek to frame the issues with research and by seeking public input. One example was my service on the committee to fund sidewalk improvements. We gathered input from citizens on all sides of the issue and brought a recommendation to council, which passed unanimously. This public program is a rousing success. I do my homework. I am informed. I have been at every work session, not all of which have been attended by my detractors; I come prepared, I ask questions and I am effective. I have been elected twice by the people in spite of the pervasive, documented and public calumny from city management and certain councilors. • Calder says she wants more citizen participation, yet she went along with the mayor to deny citizen involvement in the recent firing of the city manager. I did support the mayor’s process, which was appropriate for a personnel matter. My history shows a strong effort to encourage citizen participation: I sponsored a bus to bring citizens to council meetings from the senior centers. I poll citizens on issues before the council; I encourage people who speak to me about issues to attend the council meetings and speak. I have advocated for years to allow 3 separate readings of new/amended ordinances in order to allow the public 2 additional weeks to comment. • Calder places her own agenda ahead of the interests of the citizens and has contempt for anyone who disagrees with her. I have served two terms on the council and I have not folded when under extreme attack for voicing opinions different from the former city manager’s or the councilors who have supported him unquestioningly. This is not in my best interest, but it is my duty, and it certainly doesn’t further any personal agenda. Chief Petitioner Jamey Hardy told me that my “agenda” was displayed when I ran for the school board 2 years ago. She stated the Baker City would have a new Middle School if not for me. I was part of a large group that wished to keep the conversation about building options going following 2 failed bond elections for a new structure. I was putting the interest of many citizens ahead of my own by stepping up. There was no monetary consequence one way or another and no expectation of any. I was not elected but was able to foster healthy discussions about maintaining and repurposing our buildings. When I am treated with contempt I have responded by holding the attacks up to the light; I cite the City Charter and Resolution 3407 (Council Rules) and the extensive research that underlies my opinions. I maintain my dignity. Exposing attacks is not contempt, however uncomfortable it may be for the perpetrator. • She acts independently of the city council to advance her interest despite the needs of the city. My interest is to perform due diligence as an elected official. The needs of the city, any city, are to have diligent and unbiased councilors. My interest as councilor and the needs of the city are one and the same. I have no personal or business agendas that influence my reason for serving or my decisions. I form my opinions on the facts, the research and the input of citizens. Examples that may be cited against me were actually to the benefit of the city and its citizens. A year ago city management and the Police Chief advised that a liquor license be denied to Pizza Hut because of an old felony conviction of its manager of 15 years. I contacted our regional OLCC inspector to ask if they had reservations about renewing this license and he said “no.” The franchise had a new owner and the renewal was simply a housekeeping matter. I either preserved the job of a family man who had paid his debt to society or I preserved the right of the restaurant to compete on a level playing field. The recommendation for denial was discriminatory and arbitrary. I shared the information I gathered with the council which then ruled to support the new license. • Calder’s positions on issues are controversial and inconsistent with the public good. These comments were related to me by citizens who, at this point, are afraid to file formal complaints. Former City Finance Director Laura Harryman was approached by BC Police officer, Shannon Regan in the city park and asked for her signature on a petition. 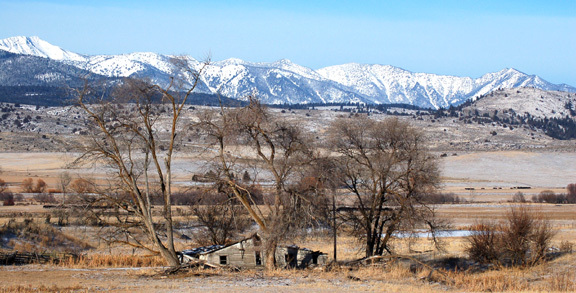 When she stated she lived outside the city limits, she was told she could sign it anyways. Former Councilwoman Peggi Timm saw a petition placed on an ‘un-manned’ table in The Sycamore Tree, a downtown retail store. No one was there to witness signatures. Several of the pages turned in were signed by the owners of The Sycamore Tree, Jacquelyn and Lance Adams. Don Fink, who currently has a contract for services to maintain the city cemetery and parks was approached by a uniformed BC Police officer. The officer retrieved the petition from his patrol car and asked Don to sign. Many have had their thoughts expressed. I have obviously presented only a part if the case against the recall and hopefully will find time to present more information, even if it is just a post-mortem. There simply isn’t time for a line-by-line rebuttal of so many false or distorted “facts” that recently issued forth from the perpetrators of this crime. I wish that the local press had presented much if this information, as most is largely public record and readily available. We read the charges in the paper, but there has been little to be read about Dorrah’s and Calder’s response, and few serious questions about the recall committee’s behavior. You will decide for yourself whether you think their outrageous claims and actions, which have turned neighbor against neighbor and family member against family member, were worth it. Thank you for the information on your site. I knew that things were bad but I wasn't fully aware of how bad things really were. Bev is very wise in keeping her thoughts to herself. I can't even imagine how much it pains her to see and hear the things that are said about her. I have said it before---this is a back-biting witch hunt. [CORRECTION (9/14/09): I wrote in my blog and in an LTE: "A sergeant’s salary with 5 years goes from $51, 876/yr to $61, 224/yr plus benefits under the Brocato negotiated contract"
I am, like most of us, not infallible. I do the best I can with published information in public records I am able to obtain. If someone has information that corrects these figures, or has relevant information than differs from what is in the contract, I would gladly consider it. I am not including any money given to employees for overtime, such as at downtown events.